I've been to a few themed outdoor exhibitions of sand sculptures and they never disappoint, although I was disappointed there wasn't a Sandstorm event last year in Sydney. I'm happy to say, though, that another sand exhibition is back this year in a brand new location at Blacktown Showground with a new theme - 'Alice in Wonderland'. The detail that goes into these sculpture masterpieces is nothing short of amazing and this year it will be no different. 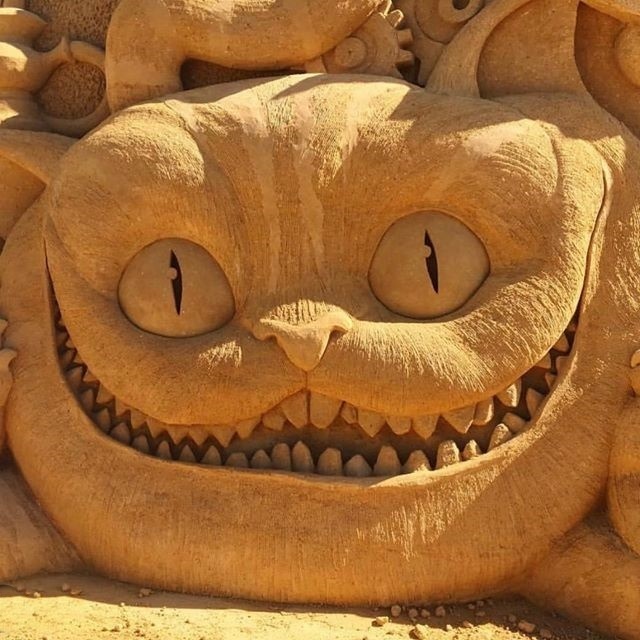 Sand Sculpting Australia have gathered ten talented sand sculptors, from Australia and overseas, to put together a collection that writer Lewis Carroll would be proud of. All your favourite characters from the book will be brought to life in over 250 tonnes of sand for you to peruse and photograph. There's Cheshire Cat, The Queen of Hearts, The Mad Hatter, The Caterpillar, Tweedle Dee, Tweedle Dum and more. There's also an interactive sand sculpture, sand art activities, sculpting workshops and a family game zone that will keep the kids busy. Face painting is also available and when they're hot and bothered an ice cream van will satisfy, along with the water playground in Francis Park (part of the Showground precinct). Additionally, the Grounds Keeper Cafe is open 6 days a week (closed Tuesdays) and will have you lingering longer with their fresh and delicious food. Serving everything from Wagyu burgers to chicken tenders and chips, plus pancakes and omelettes - there's something to suit all tastes. From 9am-5pm daily (till 4pm on Australia Day) in the Showground Plaza, you'll find the sculptures and activities in rain, hail or shine. All the sculptures are protected by a special coating of biodegradable glue whilst the activities are all under marquees. Tickets for this event are $12 per adult and $6 per child with a family pass at $28 (2a & 2c). You can purchase online or at the entry ticket box on the day with both cash and Eftpos accepted. Getting there is easy by train or bus to Blacktown station and then it is a 5minute walk to the Showground. Onsite parking (free) is available for those that wish to drive with entry through the Showground Gate at the lights on Richmond Road. So come on down and fall through the rabbit hole with Alice, join the Mad Hatter for tea and convince the Queen of Hearts you didn't steal her tarts.